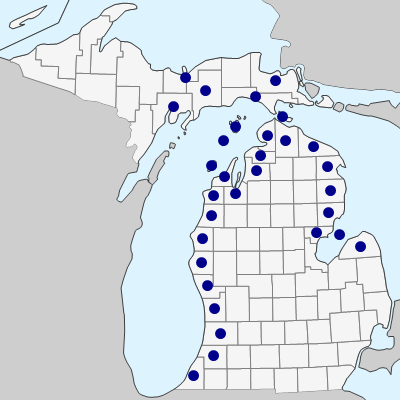 Endemic to the sand beaches and dunes of Lakes Michigan and Huron, and at two sites on Lake Superior. Listed as threatened under both Michigan and Federal law. 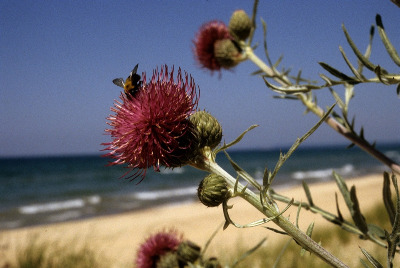 This thistle was first noted by Zina Pitcher “on the great sand banks of Lake Superior,” presumably the Grand Sable Dunes and during the 1826–1828 period when Pitcher was stationed as an Army surgeon at Fort Brady (Sault Ste. Marie). This is a relatively mild thistle, with only short spines at the tips of the leaf lobes and the phyllaries. The whitish foliage and flowers set this apart from all our other thistles, but they blend well with the dunes on which it grows. A first-year seedling consists of a very small rosette of leaves, but rosettes in subsequent years are more robust, from a very deep taproot, and flowering usually occurs in 2–8 years, after which the plant dies. (The species is monocarpic, not strictly a biennial) The fragrant flowers are popular with insect visitors and heads can be as broad as 5 cm at full bloom. Plants are occasionally well over 1 m tall, but are usually shorter and may be quite bushy-branched or single-stemmed. Plants with numerous heads may bloom over a long period (2 months), starting in late June. At one site in Mackinac Co., plants occur with striking deep purple heads, f. magenteum E. G. Voss (2001). MICHIGAN FLORA ONLINE. A. A. Reznicek, E. G. Voss, & B. S. Walters. February 2011. University of Michigan. Web. April 19, 2019. https://michiganflora.net/species.aspx?id=290.